WARNING! Super long post but worth the read! I am so excited to share some news that my heart feels like bursting! A small stepping stone to bigger and bigger things! I have recently signed my own studio and I have been working hard to get everything set up. My stress levels have been through the roof as I prepare everything for the grand opening. However, I have to remind myself that I am creating a basis for future opportunities. 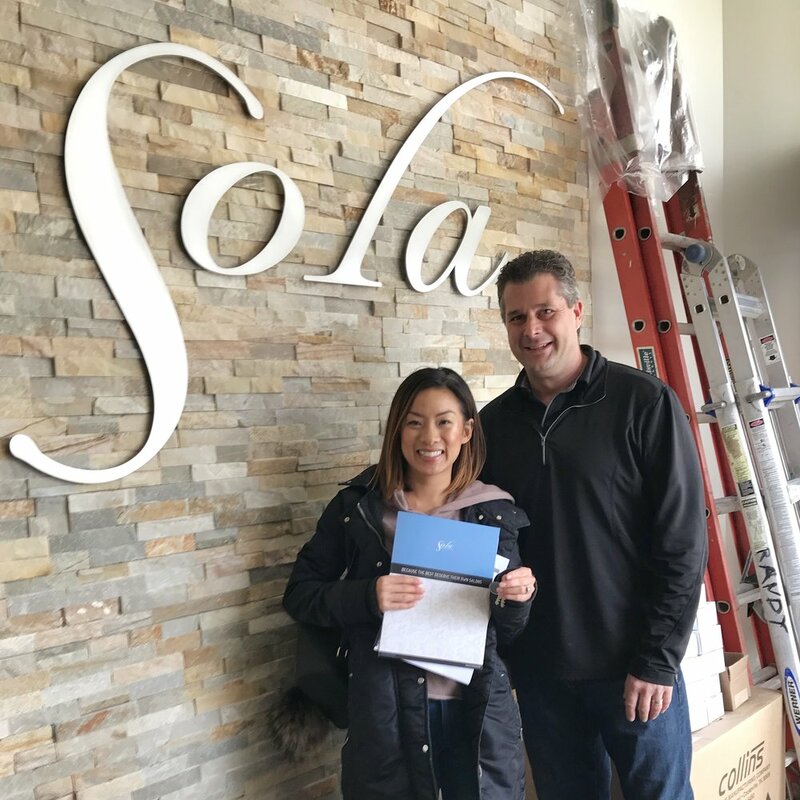 My journey began as I toured the new Sola Salons Powell. I immediately felt at home and quickly realized that the private studio life is the perfect fit. Today, I am sharing something a little more personal on the blog. Some background and inspiration of my dreams and watching them reach fruition! Also, proving why you should listen to you inner voice! I don’t know if this is a shocker to anyone, but I have dreamt of moments like this since I was in high school. I knew I wanted to be in the beauty industry since high school and dreamt of having my own place, but I didn’t know how I was going to get there. I wish I could find my senior project from high school where we had to submit a piece answering “Where do you see yourself in 10 years.” My project had a picture of me holding up a makeup brush against my face and smiling. In my project I wrote something along the lines of “In 10 years I envision myself as a makeup artist or having my own place for beauty services.” I even went as far as describing how it would look like with tall frosted glass doors. It all started from my earliest days as a sixth grader wearing chunky glitter all over my eyes and face to school everyday. It gave me a rush and I wanted to share my glittery contraband with my classmates. My teacher told me multiple times I could not wear this glitter nor share it with my classmates, however I continued with my rebellious ways. I always went off to school with my little backpack full of small jars and roll on glitter for all! It was how I expressed myself as I attended a school where uniforms were a requirement from Monday to Thursday. Basic navy blue paired with pure white attire. Friday was called “Casual Fridays” where you can sport jeans and whatever floats your boat! Of course I remember the type of jeans I requested my mother to have prepared for me on Fridays. They were these extreme bell bottoms with reflective multi-dimensional graphic smiley face by the slits of the jeans. I was covered in glitter from head to toe, sporting bell bottoms and don’t even get me started with my hair! When I entered middle school I was wearing a pretty advanced winged liner for a middle schooler, LOL. From a young age, I feel like my life has been stepping stones to pushing towards my calling. For many years I saw my vision of what I wanted, but again I did not know the steps to get there. In High School I felt lost, while constantly seeing my classmates choose paths where they were confident in. From doctors to teachers, and lawyer, etc., I knew I had to discover my own path. My heart pulled me towards a beauty career, but I let exterior voices fog my inner thoughts. Even the closest people to me projected their own fears on me with their career advice. I had to quickly realize that if you listen to others, you will not live the life that is unique to you. Despite having a burning passion for making beauty a career, I forced myself to attend college. I went to The Ohio State University with a exploring major then transitioned into business. I then went on to switch to dental hygiene, until finally I listened to my inner voice and enrolled in Esthetics School. I often wonder why it took me so long. Maybe I was still having a hard time accepting that a creative career was respectable to my family. As the years went on and I gained more confident in my skills and choices the wheels were turning in my head. Generating small actions and steps towards my dreams. Because I gained more confidence, I then gained more clear thoughts. I discovered you have a choice! It may sound silly, but you do have a choice on what you want out of life. Often times we let doubt, fear, and anxiety prevent us from following our true path. I call this living in a rut. Sometimes we manifest our own thoughts to reality even before anything even happens. We create illusions in our minds that stop ourselves from doing something before a single step is taken. Why do we continue to go against ourselves and doubt your outcomes? Is it because we are all secretly fortune tellers and we can predict our own futures? No, it is because we let exterior noises cloud our judgment and weaken our thought process and mental strength. Finding inner peace has been the biggest catalyst for me. I have had to learn to be happy with my own path and to end the comparison of myself to others. Inner peace has propelled me forward to achieve my goals. I was not happy with my previous situation that it led to the feeling of depletion. Years and years of energy were emptied, with loads of stress catching up to me. I was acting out on fear, anxiety and anger. I lost my shout in life. I have always loved the quote “What if things are happening for you and not to you.” I find this to be so true. I am truly grateful for the experience from my previous life events, as I have discovered my great mental capacity and strength. Life is not about the big break. It is about taking small steps towards enlightenment. One small step at a time! Welcome back to my weekly beauty blog post. Today I will conducting my first product review and first impression on the WunderBrow 1-Step Brow Gel. I am currently working on this post while en route to California to see my family and of course, visiting Disneyland for my niece's birthday! I used to feel there was a lack of time available, however lately, I have been feeling the opposite. Instead of feeling like I don't have time, I create time for events and tasks that are at the top of my list! Especially like working on my blog and business, which to me is essentially working on myself and becoming a calmer version of me. I am always searching for beauty products that can improve my efficiency in getting ready! Can this one product replace my beloved eyebrow routine!? I ended up purchasing two colors; Brunette and Black Brown. The Black Brown is more up my alley as the Brunette washed me out (I discovered that after a girls dinner where pictures were taken LOL). My first impression is that is it difficult to create a shape because of its liquid texture. It is almost too watery. The longer you work it, the more it drys and gets tacky. The gel then gets saturated to the hairs and this is when the spoolie is handy! Using the spoolie, I comb through and break up the gel, which fluffs them out a little bit, so the brows do not look chunky. I believe this product was designed to replace brow pomade, powder, and gel. However, something about the texture of this product and its application on the skin/hair makes the end product look patchy. The longevity is great, but the patchy application causes me prefer Dip Brow. I will still continue to use this product, but for now it won't replace my current beloved routine mainly due to the difficulty of creating a consistent shape. I will be testing the longevity furthermore during my day with my family at Disney!